…spigot is sealed by two Teflon® O-rings. Delivery spout takes 5/8” i.d. tubing; polyethylene adapter that takes 1/4” to 3/8” i.d. tubing is supplied. Dimensions (height x o.d. 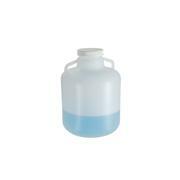 ): 10 liter carboys measure 15” x 10”; 20 liter carboys measure 20 7/8” x 11”. …Leakproof Neck i.d. 3 1/2 inches Graduated to contain in 1-gallon and 5-liter increments Dimensions: 10 liter carboys measure 13 3/4” high x 9 7/8” o.d. 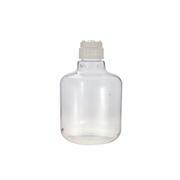 ; 15 liter carboys measure 15 1/4” high x 11 1/4” o.d. 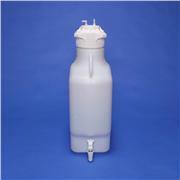 ; 20 liter carboys measure 19 3/8” high x 11 1/2” o.d. …from High Density Polyethylene (HDPE), they feature comfortable handles and tamper evident, secure seal caps that follow DIN recommendations. 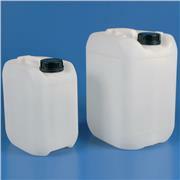 The larger sizes (5, 10 & 20 liters) conform to the UN regulation on transportation of dangerous liquids. All are approved for use with food products. …esters, hydrocarbons, etc. 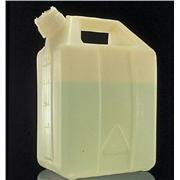 Graduated to contain in 1-gallon and 5-liter increments Neck i.d. 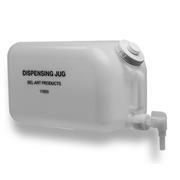 2 3/4” Dimensions: 10 liter carboys measure 15 high x 10 o.d. 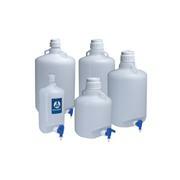 ; 20 liter carboys measure 21 high x 11 1/2 o.d. 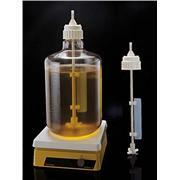 NOTE: Before autoclaving, set cap on top of carboy without engaging threads. 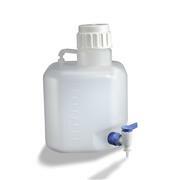 …place of cap Not recommended for use with hazardous materials Autoclavable and leakproof Dimensions: 10 liter carboy: 15 1/4” high; 20 liter carboy 20 1/2” high; 50 liter carboy 26 1/2” high. 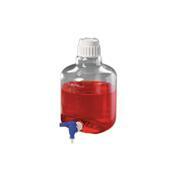 Before autoclaving, set cap or closure on top of container without engaging threads. 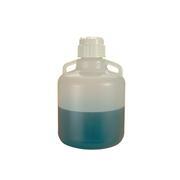 Nalge 2318 series Supplied with cap and Thomas number 1753C67 spigot Leakproof Sizes 10 L and larger have two molded handles and take Cap No. 83B; 4 L size takes Cap No. 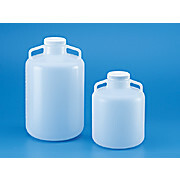 38-430 Graduated to deliver in 1-gallon and 5-liter increments. 4 L is not graduated. …loss. Long, integral spout allows easy pouring. Leakproof jerricans have molded-in graduations and fluorinated polypropylene closures, size 53 mm. Dimensions: 10 liter Jerricans measure 7 1/2” x 9” x 14 1/2”; 20 liter Jerricans measure 9” x 12” x 17 1/2”. …is not compatible with acetone and organic solvents.) The spigot extends 58mm (2.3") from the bottle. Flat rectangular bottles store on a shelf like books in a library. 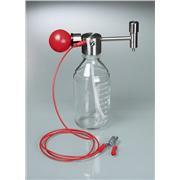 Dispensing spigot has 9.5mm (3/8") I.D. outlet to accept tubing. Graduated in liters. 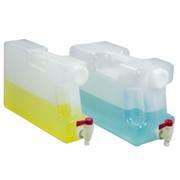 Two molded in handles for safe transport.